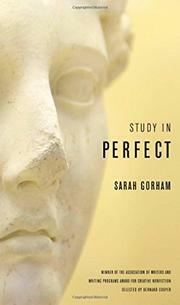 Perhaps I was drawn to Sarah Gorham’s collection, Study in Perfect, because for the past few months my life has been a study in chaos. To make a long story short: bedbugs. Before I knew what I was doing, I had spread them to my parent’s house, my boyfriend’s house, and the new house I’d just moved into. I thought I could depend on professionals to treat the problem, but two companies, and two enormous checks, failed to halt the runaway bug train of destruction. The problem ravaged my bank account, possessions, routines, and relationships, and it forced me to confront some inner chaos: my tendencies toward denial and inaction, my addiction to crippling anxiety, my blind reliance on authority figures. Essentially, I feel like I’ve been sentenced to some kind of bedbug therapy. Gorham’s collection of essays contains many such moments of unraveling: a daughter’s brush with a deadly infection, a husband’s alcoholism, a mother’s passing. So much disruption and suffering might seem out of place in a book on perfection, but when things fall apart, we cling harder to perfect. Out of my chaos, I came to this collection seeking a cool, philosophical meditation, something abstract and safe. That’s not quite what Study in Perfect offers. It’s true that Gorham’s voice is often philosophical, asking unanswerable questions and proposing theories about how the world works. In the essay “On Lying,” she posits, “We are made of many selves, not just one. Over a lifetime, we float between honesty and fabrication, between conformity—our dependence on others—and the urge to be separate from them. Maybe the natural truth is dependence and the denial of it is necessary for us to accomplish anything beyond basic survival.” To support her elegant conclusions, Gorham draws examples from history, linguistics, pop culture, science, and literature, as in her fascinating exploration of the species of poisonous mushroom, Amanita fulva, featured in the legend of two doomed lovers. But rather than remaining in the distant hypothetical or the realm of history or legend, most of Gorham’s examples of perfection and imperfection are solidly embodied in a particular life: its physical environments, human attachments, and trials and tragedies. Things do fall apart. And when they do, we have the opportunity to see how our idea of perfect may need revision. The concept of perfection, Gorham writes in the introduction, “by its nature embraces imperfection.” But rather than being two sides of a coin, perfect and imperfect bleed and fuse, as in one essay where Gorham describes two different colored clays being worked into one another in the Japanese ceramic art of neriage. In “Marking Time in Door County,” Gorham sets up the ideal family vacation, which brings with it the pressure to soak up every moment of togetherness and relaxation. We ask, are we doing it right? Have we missed anything? Did we need to go to the movies twice in one week, or would we have had more fun at mini golf? Our addiction to perfect makes perfect impossible. This is why we need moments to scatter us like blown dandelion seeds, when the possibility of attaining stability—let alone perfection—seems as remote as sleeping with a movie star. The bar gets way lowered, and somehow we stumble upon perfection more often, in smaller things. Gorham’s examples, appearing as short meditations following longer personal essays, include the perfect word, the perfect barn, the perfect sleep, the perfect conversation, and the perfect tea—not as it’s served up in a fancy tea house, but straight from the microwave and sweetened with honey. In “Neriage, or What Is the Secret of a Long Marriage?” Gorham describes the process by which two individuals abandon their hang-ups and recalibrate their hardwired habits to meet in the middle. She likes things tidy and he thrives in disorder, but they come to respect each other’s way of being in the world. Can we find perfection only in compromise? Or does perfection, by definition, exclude any kind of revision of expectations? It’s all about how you define “perfect,” and though Study in Perfect declines to offer a definition, it demonstrates the many gradations and contradictions held in one alluring word. Claire Eder’s poems and translations have most recently appeared in The Common, Guernica, the Cincinnati Review, Sakura Review, and the Adirondack Review. She received her MFA from the University of Florida and is currently pursuing a PhD in poetry at Ohio University.